The initiative petition language is found here. How can there be a property tax increase without the words “tax increase” or similar on the ballot? It’s in the initiative petition by reference. I know that Article VI, Section 26, Missouri Constitution, when mentioned in a ballot issue, means tax increase per Section 26(f), most voters do not. There was a meeting back in August on this ballot issue supported by BOA President Lewis Reed but the thread posted on Nextdoor (subscription required) was shut down shortly after questions were raised. Perhaps if the discussion had continued, the petition could have been improved before being circulated for signatures. A solution to vacant buildings is, obviously, a good thing. But it seems to me these matters really should be hashed out by our elected representatives before going to the voters and changes made to improve the ordinance. BOA President Reed could have sponsored this proposal as a board bill but chose not to. Subsequently, voters will be bombarded with not only candidate and ward poll workers handing out literature on November 8th, but there will also be at least two initiative petitions being worked for signature gathering on election day. More later on the other initiative petition I am aware of. The ballot issue committee- Neighbors for a Stable St. Louis- filed its first campaign finance report in October. Among the contributions received: $2,000 from Stephen Smith (mega-developer and future Hall of Fame Corporate Welfare Recipient Lawrence Group) and $2,000 from Kenneth Kranzburg (container manufacturer TricorBraun); $100 from former Mayor, former School Board Member Vincent Schoemehl. In expenditures, a total of $2,500 had gone to Vibrant Communities Consulting (Sean Thomas, former Executive Director for Old North St. Louis Restoration Group). I have no information on whether any of the people collecting signatures on this petition are paid to do so. I have not yet really reviewed the petition language for the actual program it seeks to fund. I would like to see the Board of Aldermen send voters a charter amendment to remove city bond and tax issues from the local initiative petition process. This would also stop Rex Sinquefield’s consultants from spending his money on new, local anti-earnings tax initiatives. Because of Rex Sinquefield, we are already required to reauthorize it every four years. I would also like to see the Board of Aldermen send voters a charter amendment to require disclosure in voter-friendly language that a ballot issue is a tax increase. What Do Zombie Hunter Chris Loesch and Paul McKee Have In Common? Today in corporate welfare news, St. Louis City’s Board of Aldermen HUDZ Committee approved Tax Increment Financing and a sales tax increase to benefit Developer Paul McKee’s car wash, gas station, and grocery store development. The committee vote on this was 4-3, with 5 aldermen absent or not voting. Voting for the Tax Increment Financing (TIF) and a sales tax increase to fund a gas station, car wash, and grocery store were 7th Ward Alderman Jack Coatar, 17th Ward Alderman Joe Roddy, 19th Ward Alderwoman Marlene Davis, and 28th Ward Alderwoman Lyda Krewson (also a candidate for mayor). Voting against the two bills were 15th Ward Alderwoman Megan Green, 20th Ward Alderwoman Cara Spencer, and 21st Ward Alderman Antonio French (also a candidate for mayor). Absent or not voting on the measures were 3rd Ward Alderman Freeman Bosley Sr., 4th Ward Alderman Sam Moore, 8th Ward Alderman Steve Conway, 18th Ward Alderman Terry Kennedy, and 27th Ward Alderman Chris Carter. Wait. There’s More. Paul McKee’s mega gas station project needs a small business loan and that will come tomorrow from the St. Louis Local Development Corporation: Item #7. St. Louis Local Development Corporation is a nonprofit created by statute with no accountability to voters. In addition to Item #7, note Item #4, a loan to Triumph Systems. This was on the September Agenda and the meeting was canceled the morning of the meeting. Triumph Systems makes Zombie and Terrorist shooting targets. Triumph Systems is not just any old zombie target company. It has celebrity connections. On staff is Chris Loesch, husband of right wing talk show host Dana Loesch. They are former 7th Ward St. Louis City residents, now of Dallas. Mr. Loesch previously benefited from corporate welfare as an owner of Shock City Studios on Gravois in the Benton Park Neighborhood. That project received Brownfield tax credits and TIF from the City of St. Louis. UPDATED to include response by Board President on his failure to provide transparency on his own meeting notices. Over the past year, day after day, I have laid out the damning evidence of the City of St. Louis’s crappy job at transparency with regard to meeting notices and materials. Most public meetings are not posted to the City’s online calendar. Some meeting notices are only posted in hard copy form near elevators at City Hall. Sometimes meeting notices are posted less than 24 hours before the meeting. 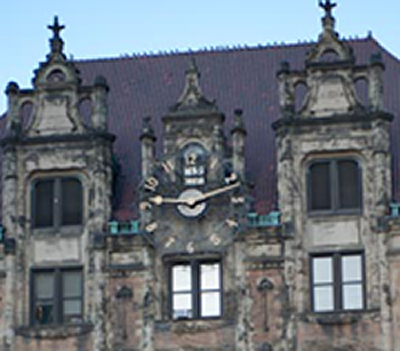 Some meeting notices that are not posted to the City’s online calendar are instead posted on the agency’s webpages. Sometimes this is a link on the “Board Meeting Materials” page, sometimes elsewhere. There is no consistency. You can spend a lot of time hunting for the information only to find the link is bad. 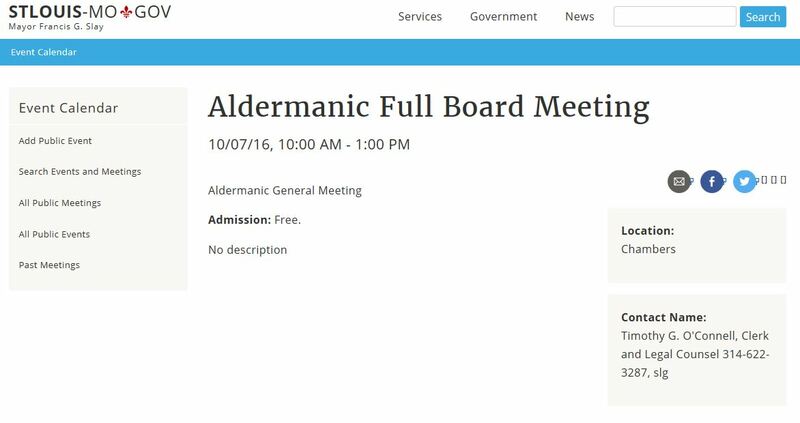 In cases where a meeting notice is posted somewhere on the City’s website, it often will not include an agenda. Most meeting notices with agendas do not include exhibits/attachments. It’s a wet hot mess. It’s 2016 and the City of St. Louis has no central online location for citizens to find information on public meetings and hearings in a timely manner so as to make their voices heard before a decision is made. And Board President Lewis Reed blew it. This week he filed Board Bill 152. It does not require posting of meeting notices in a central online location. 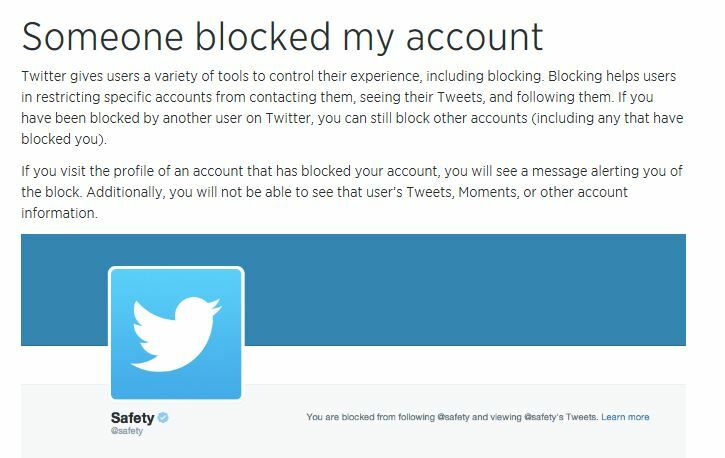 There is no identification of who is responsible for the posting or the penalty for failure to do so. It only requires 24 hours notice. It does not require an electronic time/date stamp on the posting (which actually was once done on City website but disappeared). It does not require posting exhibits and attachments mentioned in agendas. It’s lame and it needs to be called out for what it is, a piss poor mayoral campaign gimmick. Lewis Reed does not provide Board of Aldermen agendas with the BOA Calendar Notices. He’s a hypocrite. He could have been providing that information by simple link iNall these years. Lewis Reed doesn’t need passage of a board bill to put his own house in order with regard to transparency. All City departments, agencies, boards, commissions, special districts, political subdivisions funded by City tax dollars should be required to have a designated public records officer to handle Sunshine records requests and post meeting or hearing information where applicable. In the case of appointed boards and commissions this will likely be the secretary. The City’s Register might be the designee for offices that she publicizes hearings for in the City Journal. The public records officer should be responsible for posting online meeting and hearing notices with agendas, exhibits, and attachments, at a minimum by 9 am the Friday of the week prior to the meeting or hearing. Public notices required by city, state, or federal law to be posted as more advance notice should comply with those requirements. These notices of meetings and hearings should be posted to a central location on the City’s website or some other location with link on City’s home page. These notices should have an electronic time and date stamp that cannot be tampered with. These notices should include a link to the last approved Meeting Minutes of the entity, where applicable. Meeting Minutes and Materials should be archived online in perpetuity as well as microfilmed or digital copy made. Blighting reports should also be available online and linked when cited on agendas. Penalty for failure to comply and enforcement should be included in the ordinance. Let’s get that done. Let’s get a central online clearinghouse for public meeting information. But let’s not pass a board bill that basically says it’s OK to stick a meeting notice anywhere on the City website and call that progress. Let’s get some real transparency going. And, then, if someone wants to get all fancy with subscription email notices, figure out how to do that by subject matter, zip code, etc., so that subscribers are not getting hundreds of meeting and hearing notices every day when all they want to know is when there is a liquor hearing affecting their zip code, when their special taxing district meets, or what is on the agenda for the Board of Aldermen’s Public Safety Committee. This weekend, in response to criticism of his poorly drafted bill and failure to provide transparency at the Board of Aldermen, Board President Lewis Reed blocked my Committeewoman Twitter account. Board President Reed does not want to hear us but it does not stop us from speaking truth to power. Please contact your alderman and ask them to amend Board Bill 152 to include real transparency on public meetings and hearings, including posting all meeting and hearing notices and agendas in one online location and providing accountability if that is not done. Whatever Happened To Lyda Krewson’s Reduce & Reform Committee? When I first saw the initiative petition to change municipal election dates, I thought maybe Reduce & Reform STL was behind it. It appeared to reduce the number of elections. I have long been an advocate of moving all our elections together to increase turnout and reduce costs. Finally some reform I could support, or so I briefly thought. Reduce & Reform STL was the ballot issue campaign committee created by 28th Ward Alderwoman Lyda Krewson and 8th Ward Alderman Steve Conway to support passage of Proposition R, the November 11, 2012, Charter amendment to reduce the number of wards from 28 to 14. I opposed that amendment but did not actively work against it at the polls. I thought then, and still do, that doubling the number of constituents, neighborhoods, businesses, and institutions requiring an alderman’s attention is creating a big mess. But, I had just been elected a committeewoman that August, my alderwoman sponsored the board bill to put it on the ballot, and I had yet to form a ward organization or raise any money. 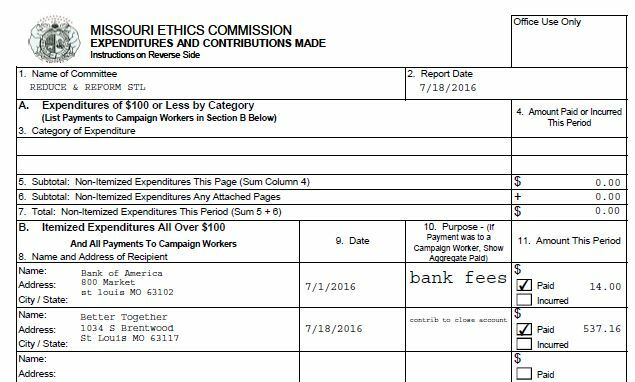 After the election, Reduce & Reform STL filed with Missouri Ethics Commission to convert the account to a political action committee. It transferred $929.16 from the old committee to the new one, kept the same name, and kept Krewson as Treasurer and Conway as Deputy Treasurer. Reduce & Reform STL reported only Limited Activity to Missouri Ethics Commission in 2013, 2014, or 2015. On March 29, 2016, just days before the April 5th municipal election, Reduce & Reform STL received a $10,000 check from Civic Progress PAC. With that money, on March 30th, it paid $4,000 to Jobs With Justice for a literature drop. Reduce & Reform STL did not report to Missouri Ethics Commission a printing bill or direct expenditure for a ballot issue or candidate relating to that literature drop. With that money, on March 30th, it also made a $6,000 donation to Citizens to Elect Jamilah Nasheed. Nasheed was not on the municipal election ballot. She did, however, spend $11,900 on Proposition E (earnings tax renewal) radio ads. On April 5, Mike Owens, husband of Krewson, replaced her and Conway as Treasurer and Deputy Treasurer. On April 8, Mayor Francis G. Slay announced he would not seek re-election. On June 14, Krewson declared she was a candidate for mayor. On July 18, Reduce & Reform STL terminated and its remaining $537.16 was donated to Billionaire Rex Sinquefield’s Better Together. On August 2, Rex Sinquefield and 5th District State Senator Jamilah Nasheed joined forces on the Police Body Cam Scam initiative petition. In September, Better Together began its initiative petition drive to move some municipal elections to state election dates but leave ballot issues, school board, and community college trustee elections as Spring elections with dramatically reduced turnouts. This is the petition to game the system in Rex Sinquefield’s favor, reduce turnout for charter amendments toward getting rid of the earnings tax and implementing other changes. It is one of three local initiative petitions Sinquefield is presently funding. Krewson has some explaining to do. When she talks about being a champion for reform, what does she mean? Rex Sinquefield’s Agenda? This City needs a champion for big change and one who will stand up to Rex Sinquefield and the consultants getting rich off him. I will vote for the candidate that I believe will do both the best. Note: There will be a meeting 6 pm Monday, October 3, 2016, to discuss launching an initiative petition drive for a Re-Vote on reducing the number of wards.